Last Friday (February 24th) I set up three new umbilicate lichen vats with the fallen lichens I collected on February 1st and 6th. I had stored them in two different bags. 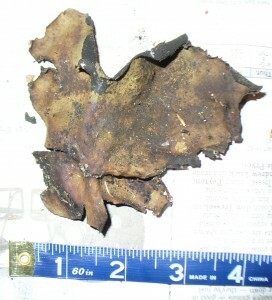 The material in one bag was damp, and the other dry and crispy. You’re supposed to dry them first, but I proceeded with the damp ones and hope it works out. Several of the pieces were enormous. If they grow half a millimeter a year, this six inch piece must have taken over 300 years to reach this size! This piece, too, must be ancient. As you can imagine, handling these things inspires awe. I crumbled up the dry ones, tore the damp ones into small pieces, and combined them. I had 12 cups all together, though “cups” is sort of relative because you can compact them, and then they spring back up again. 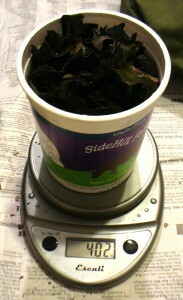 The total weight was 12 ounces. 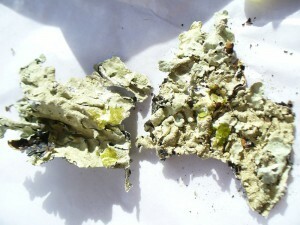 I divided the lichen pieces between three jars, with 4 ounces in each. 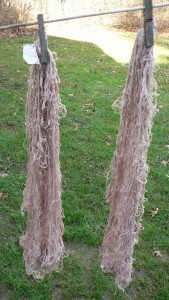 With the exception of using the damp lichen, I followed the directions in Casselman’s Lichen Dyes. I also found and re-read her article “Color Magic from Lichen Dyebaths” in Shuttle, Spindle, and Dyepot from Spring 1986 (vol. 17 #2), which I forgot to mention in my posts before. She says to choose a jar that can accommodate twice the volume of the lichens. You need a lot of headroom in the jars to allow the lichens to expand when they get wet, and to make sure there is enough oxygen in the vat. 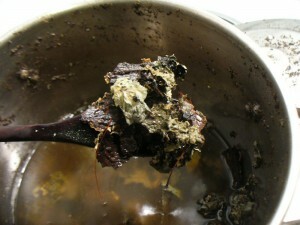 I put the crumbled up lichen in the jars, and added equal amounts of ammonia and water (2 cups of each). The ammonia solution was pH 10. You can see that the bubbles on the surface are clear (well, a very light color). 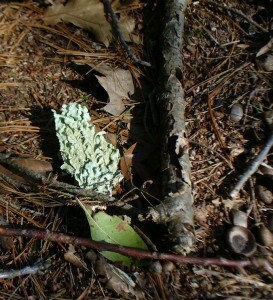 After a week of stirring up the soaking lichens each day to incorporate oxygen, the color is developing nicely. 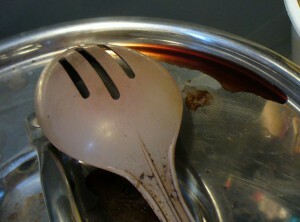 Here’s the spoon I’ve been using, plus some of the liquid which has dribbled off. 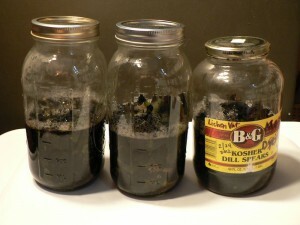 Here are the jars after a vigorous shake this morning. 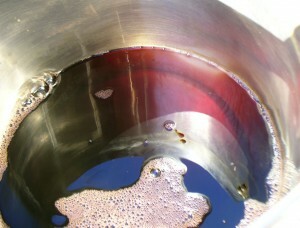 Note the darker, more reddish-colored bubbles. I have to admit that I have not been stirring as many times a day as Casselman recommends, but things seem to be moving along OK. It takes at least 16 weeks for an ammonia vat to develop and “ferment” properly. I will continue to incorporate oxygen regularly, which Casselman says is necessary to allow the orcinol to convert to orcein. So, don’t hold your breath as I probably won’t post about these vats again until June. This part of the story actually happens before the lye testing in Part Five, but to me it is the climax of the whole story, so I saved it until the end. As the ground stayed bare this winter, I continued to see lots more (probably) Flavoparmelia caperata lying on the ground, and other lichens. It made me wonder how much usually gets buried under the snow. 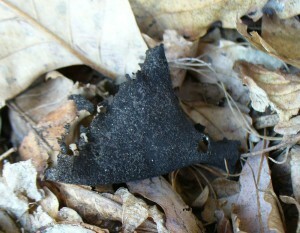 Does it usually get crushed and decompose? If it had been a regular snowy winter, I’d never even know it was there. Which leads me to…. The first of February was glorious and warm and sunny. To celebrate the day, I went for a longer walk than usual. A hike. There was not a patch of snow on the ground anywhere, only occasional ice. Just as I was thinking about how happy I was that this non-snowy winter enabled me to learn more about lichens, I noticed a lot of umbilicates growing on a rock face that I’d never really noticed before. I scrabbled over to check at the base of the rocks for any fallen pieces. There was an incredible, astonishing abundance! I felt like I was in a fairy tale; I’d been thinking about how awesome lichens are, and then ta-da there were tons of them. Magic. 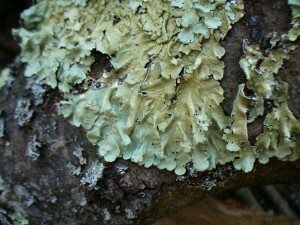 And not just any lichens, the awesomest ones. I filled both my pockets with loose pieces from the ground, but there was way more than my pockets could hold. A blissful day and a blissful foraging treat. Here are some photos. 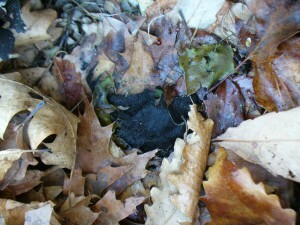 Some pieces were right on the ground, and some were hidden under the leaves. 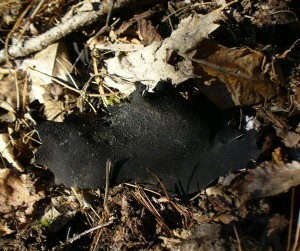 The underside of these umbilicates is velvety and black. 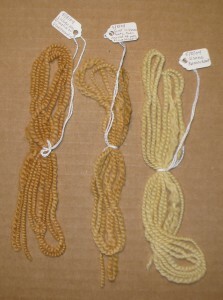 The top is greenish, olive, or brownish. 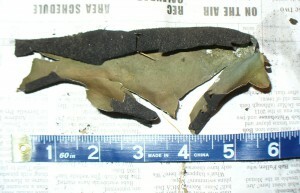 They are sometimes called “rock tripe,” hence the labels on the photos (if you hover over or click on an image it tells you the title of the photo). I went back to the same spot on February 6th (another glorious day) with a gallon sized zip lock bag, and filled that also. The discovery of this abundance made me wonder whether this much falls off every winter, or whether more pieces than usual broke off this year because of the weird (comparatively warm and dry) weather. Would I find this much again another winter? I’m not sure, but I don’t think so. I think this weird winter was special. This is a long story. I will tell it in parts. 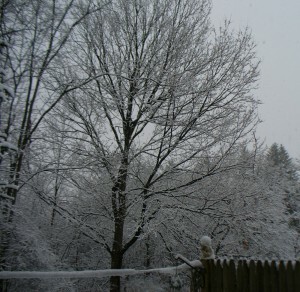 At the end of October, 2011, we had a big snowstorm. The snow was wet and heavy, and snapped and broke tons of trees and branches. There were sad broken trees all over the place, and it took a very long time for all the wood to get cut and stacked or moved away. In the woods, depending on how much people-traffic there is, a lot of trees and branches are resting where they fell to this day. And many of these trees and branches were, and are, covered in lichens. It was an unusually early storm with an unusually destructive impact–the first installment of the weird winter, weather-wise. 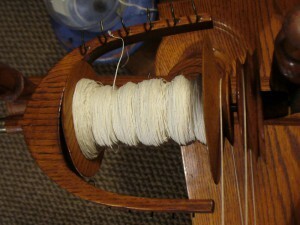 Around this same time, I was planning a series of cellulose dye projects. 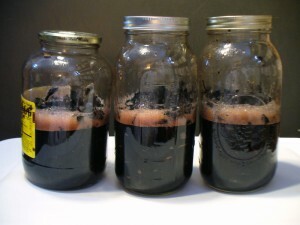 One of the dyestuffs I wanted to use was an umbilicate lichen fermentation vat that had been sitting in the closet for an indeterminate length of time. Well, it was determinate. Since July 2006. I know, ridiculous. 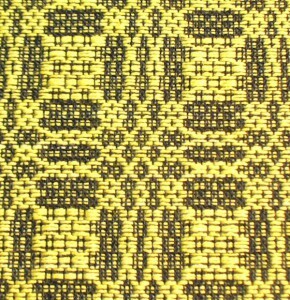 I blame my Master Weaver certificate. 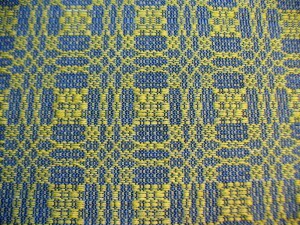 After so long, I figured it was time for a refresher on lichen dyeing, so I re-read Karen Diadick Casselman’s Lichen Dyes. 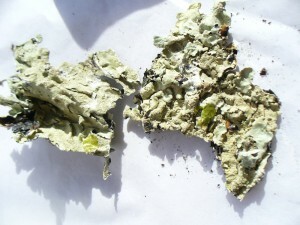 My first lichen experiments were in 2004. I used two different types that had fallen from the trees onto a lawn on Cape Cod. 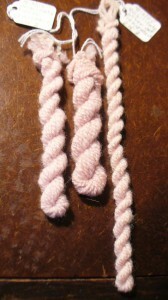 With the boiling water method and no mordant on wool (Finn), one type produced a warm creamy yellow, and the other golden brown. I never did positively identify them. The one which made yellow was possibly some type of Usnea (my best guess was Usnea strigosa), the other possibly a Flavoparmelia (F. caperata?) 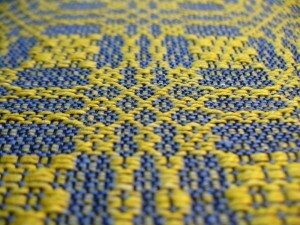 or Rimelia (R. reticulata?). Both lichens yielded colors that were much better than beige, but I felt like I could get these colors in other ways, so I didn’t try them again. Some lichens make amazing colors in the magenta, red, and pink range, with an ammonia fermentation vat. 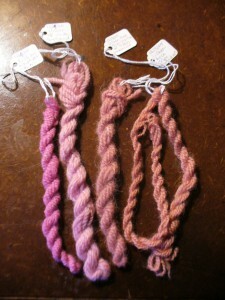 It is very hard to get these colors with natural dyes, unless you use cochineal. 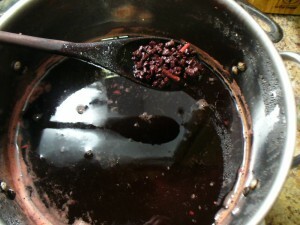 Cochineal is not local to New England. Plus, it’s pregnant female bugs and that just makes me feel bad. 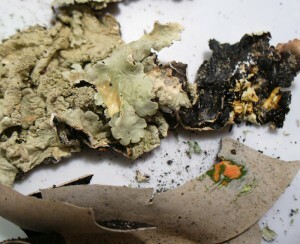 So, using these special lichens seems worthwhile to me. These awesome lichens are called umbilicates. 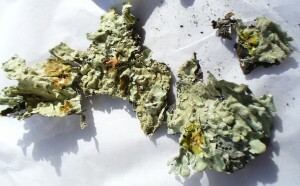 An umbilicate lichen attaches to its substrate (what it grows on) by an umbilicus, which is like a little foot or holdfast, or an umbilical cord. I’m sorry to say that I am still not positive if I have been using Umbilicaria americana or U. mammulata, or perhaps both (apparently they often grow together). 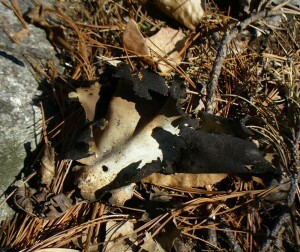 These umbilicates are not too hard to find, if you do a lot of hiking around in the woods. 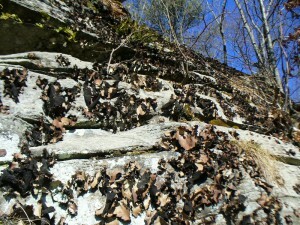 They grow on steep rock faces, and where they are happy you can sometimes find tons covering the whole surface. It’s a simultaneously earthly and alien sight. 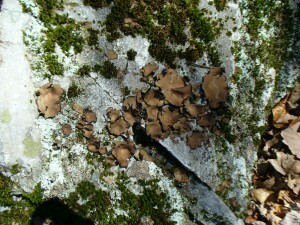 If you tear around the edge and leave the umbilicus attached, the lichen can keep growing. 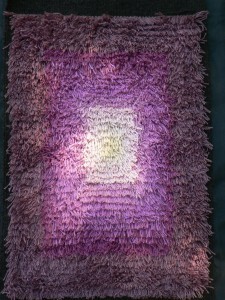 My practice had been to gather infrequently and sparingly from several different spots. This was how I gathered the jar-full that had been sitting in the closet in an ammonia solution fermenting for oh so long. I have used them a few times very successfully on wool. 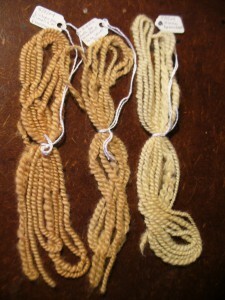 Here are the samples of my umbilicate dyebaths on wool, using the ammonia fermentation method that Casselman outlines in her book. 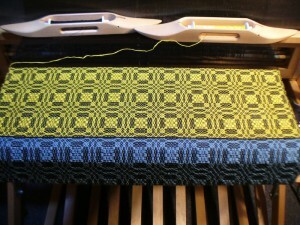 The top pictures demonstrates that too much fiber will give pale colors, so don’t be greedy with umbilicate vats. This process requires a bit of discipline and restraint. 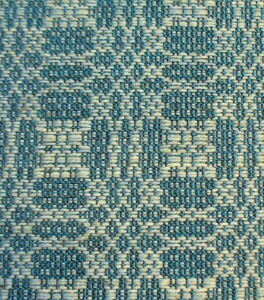 In the bottom picture, the difference in color between the samples on the right and the ones on the left is due to pH. 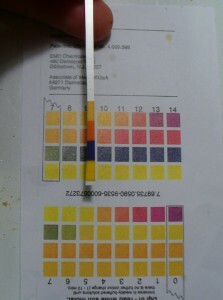 The ones of the left were immersed in a high pH bath (not as high as the vat itself, but still very alkaline). For the ones on the right, I added vinegar as well as water to the vat solution, and got the pH down to 7. 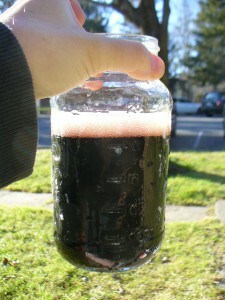 In general, higher pH (alkaline) will give more blue colors, and lower pH (acidic) will give more reds. 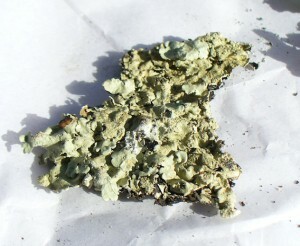 There’s more to come in the lichen saga, so stay tuned.